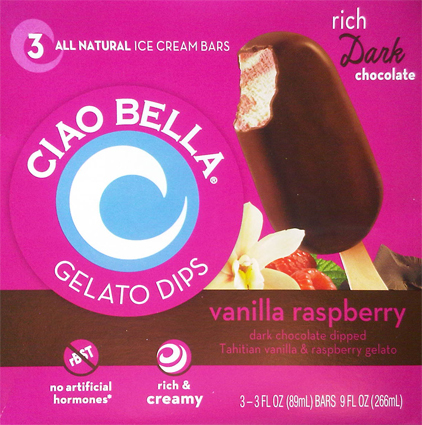 For summer 2010, Ciao Bella came out with 3 new novelties to expand on their quality line of gelato and sorbet products. Now I had heard of the key lime squares and seen them on a rare occasion here and there, but it wasn't until today that I finally spied the Ciao Bella Tahitian Vanilla Raspberry Gelato Dips. Apparently I'm not alone in my search because I can't find any reviews for them! Here they are and I want to start by saying I really appreciate the design of this box. First the bright color catches your eye, and then the chocolate bar starts to lure you in. You look closely and the words "rich Dark chocolate" hook you and there's no other choice but to pick a box up for the ride home. Sure it's $4.99 for three of them, but it's Ciao Bella.... plus we need to eat something on the ride home! 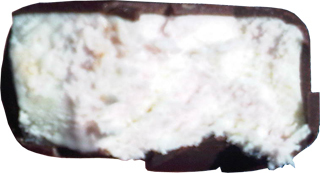 The shell is the same as in the picture, but the raspberry streaks are just slightly pinker than the vanilla gelato. (Even if the picture wasn't blurry, you would still have trouble seeing the streaks). The funny thing is that the raspberry flavor is as mellow as the color. What's even stranger is that the smell struck me as intense, but then when you taste it, the flavor is very mild. Now I need to point something else out, though I just checked the ingredient list which is not going to back me up on this point. The gelato tastes watered down. I know I've only had Ciao Bella gelato twice (including the awesome malted milk ball) but that was enough to make me realize that gelato has a different texture. I'd say it had melted a bit, but it had only been a few minutes since it left the freezer aisle. When I bit the treat, there was this weird watery taste to it. Mind you it wasn't awful, but I really don't know how else to describe it. With all that said, let's jump back to the outstanding shell on this treat. It's thick, it's a true dark chocolate, and it's easily the best part of this treat. It's easily the nicest coating I've had in a long time and I appreciate it's dark nature. The shell also has a very clean taste, and that can be said of the whole treat. I often toss out words like smooth or gritty, but hopefully you'll know what I mean by clean. I don't even really remember any aftertaste expect maybe a hint of dark chocolate. To me, it's this clean taste that speaks volumes about the quality of this product. So, awesome job on the overall process, love the shell, just wish the raspberry volume was a 6 or 7 instead of a 2. I've had that watery texture with the ciao bella vanilla gelato, but never when I've had talenti. I think it must be something with their company, not gelato in general. Oh these look tasty, the flavour sounds yummy! I wouldn't mind consuming all those calories in exchange of a very appetizing treat!